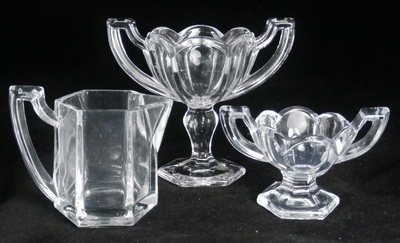 Whilst the main focus of Carnival Glass Worldwide is (unsurprisingly) Carnival Glass, we do get very excited about lots of other glassware, particularly pressed glass from the late 1800s and early 1900s. This page will be the "home page" for a look at, or even indulge in, some interesting aspects of pressed glass - there may even be a connection to Carnival Glass! Click on any of the images below to read more.